Below are answers to some of the most common questions we receive about our services and solutions. Have a question that you don't see answer for? Please contact us. How much does it cost to build a website for our organization? We have outlined some ballpark pricing on our Pricing Page. All projects are custom-quoted. Even if you are just at the planning stage, we suggest completing our quote form so that we may have your contact information. RFP Requirements - Some RFPs have unusual requirements that can increase the scope of your project. Contract Requirements - Some projects require us to accept terms of the customer's contract instead of using our contract. Those terms and conditions can sometimes increase complexity, scope, and formality of how the project is managed. This can increase overall cost. Size of the Website (not file size, but number of pages and applications). Condition of the content of the website (how much work will need to be done to clean up the code of the website). Amount of content that has to be re-written or produced before the website can be completed. Number of websites, sub-sites, sub-domains. Number of forms that need to generate PDFs (our website form builder can generate custom PDFs). Number of the people being trained. Amount of content to be entered into the staff website. What is your Hosting Fee (monthly service fee)? Our monthly service fee is $150 (or $1500 annually) for smaller municipalities. Larger municipalities are typically $200 per month or $2000/year. We have customers with custom, private clouds based on their needs, and those deployments are custom-quoted. We have come up with an affordable way to you to assist small organizations in your community. For small not profits, groups, event sites, and economic development websites that use the same design as your main site, the monthly cost is under $20. For very small sites under 50 pages, the cost is only $10 per month. This is a great way to help your community by offering turn-key sites on our platform. These sites come with all of our applications. Training and content migration are billed separately, but if you are helping the associations with this then there is no fee. We provide secured staff websites for free with our traditional municipal hosting. Compare Our Service Fees to CivicPlus and Vision Internet - There is no Comparison! You will spend over $300 per month to host just about any site with Civic Plus. We have seen some of their customers paying $500-$1000 per month, which is just way too high. Recently we won a customer who was paying them $14,000 to host their website annually, when all application fees were added up. That is insane! When comparing prices between vendors, beware of "service fees", "management fees", and other fees that are tacked onto their annual agreements. Even multi-year agreements are full of fees. We save municipalities many thousands of dollars per year in the cost of ownership of their websites. You pay ONE fee to us for your hosting. The only additional fees are for bulk email delivery, and those are nominal. Does EvoGov offer annual discounts? If you pre-pay annually for your service fee, we discount it by giving you two months free. This makes it easy to calculate because you simply add a zero to the end of our monthly fee. Very small municipalities pay $1500 per year, and all others pay $2000 per year (when pre-paid annually). See the monthly service fee section above for more information. Does EvoGov offer multi-site discounts? When you have multiple websites that you wish to bring to us, you can combine then into one CMS, or we can simply setup additional CMS installs. After we redesign your website, we can use the theme that we develop from the new design to create additional websites easily. Ask us for a quote to combine multiple websites into one project. Where does EvoGov host the websites that they build? Our technology page goes into detail about our hosting environment. Our systems run on Amazon Web Services (AWS), which is the largest and best cloud-hosting environment in the world. Our platform on AWS is built to scale scales for performance and is not brought down easily by DDOS attacks. Unlike our competitors, who have been brought down by DDOS attacks (ask them! ), our system is much more reliable. EvoGov's CMS (www.evo.studio) is unmatched in the local government website design industry. Running since 2012 - this is our latest, proven platform. Major platform updates are many years out. Turn-Key designs for your main website and sub-sites. No customer limits (unlimited citizens). SSL certificates are included free. DDOS protection is built-in, without the need to setup an expensive CloudFlare DNS service. Content Delivery Network (CDN) is included free, which speeds up your website's static file serving. Automatic indexing of PDFs and other documents. What upgrades are included with EvoGov's Applications? We continually add new features to the existing applications in our platform and CMS. We add new features to our website platform almost daily, and these are tested and then rolled-out. This is why we named our company "EvoGov" - because your website evolves with us as it is hosted, without the need for major platform changes. In addition to improvements and new features, we are also building entirely new suites of applications. When these new applications are completed, they are added to your website at no charge. Business Directories on Maps - Live now. Facility Bookings and online payments for Parks and Recreation - Q4 2017. Are there storage limitations and what are they? The short answer is "No" we do not have storage limitations. We currently do not have file storage limitations for the websites that we build and host. You can upload as many images, PDFs, office documents, web pages, and other documents as you wish as long as they represent website content. No Optical Scanning Archives - You may not use the CMS as an optical storage backup system for scanned images. In other words, if you wish to scan all of your paper documents and then serve them online as images, additional fees will apply. This is not what a Municipal CMS was designed to be used for. No Computer Backups. The CMS storage is not meant to backup any of your in-house computer systems or servers. It is strictly offered to house website content. No File-Sharing. The CMS is not meant to be a file-sharing system (i.e. Dropbox.com) for sharing large files at this time. We are working on offering this as an add-in service very soon. Is there a limit to the number of staff members? No. We do not charge per-user fees for your staff. This is also true of our request-tracking system which will save you a lot of hosting fees compared to our competition. Smaller projects, and projects which have content well-organized at the outset can take as little as three months. The larger the project, the longer the time it takes to build. We provide a timeline for each project with our proposals. Multiple planning meetings with your various departments. Automated importing of certain data from old websites. Five content guides that are tailored to your project (provided after we begin your project). Strict deadlines for building your website. Stakeholders responsible for approval of the design need to be involved at the outset. Departments that have special requirements (applications, integration, content) need their own meetings. Assign one main point of contact to head your project, who can give approvals to us and who has the authority to request responsiveness from your teams. Find photography sources as soon as possible. Identify outdated areas of your website before your project begins. Identify any missing content that will need to be created. Interview each of your departments for their goals/wishes before the project begins. Look at other websites for ideas and inspiration in how content is presented. Organize information on your users, departments, committees, etc. into spreadsheets. Is there a time limit to build our website? We like to have ALL new and existing content for your website project from your stakeholders in the first 60 days of the project. A project's timeline can slow dramatically when new content has to be written from scratch for the website. Because we need to keep projects moving forward always, our agreements do require a drop-dead date for submitting new content to the project. That drop-dead date varies based on the size of the project, but it us typically 60-90 days. Larger website projects can take as long as six months, but no project should take longer. Do you custom-build websites, or do you offer themes to choose from? We have a collection of over 20 themes that are turn-key. The features in our themes are completely interchangeable (slideshows, news sliders, etc). All elements in our designs can be used in multiple layouts. Occasionally, we are given an "admire site" from a new customer that does not use a layout like anything else that we have built. This is no problem for us, and we can build a custom layout to meet your exact needs. So everything we do is in effect "custom". Our main competitor from Kansas has less than 10 designs on their new platform, which you must choose from. You are then asked to choose a color scheme from a "warming guide" to build your website. We would never approach design in that way. Your site will be custom to you - period. Another competitor from Michigan ONLY builds template sites, and they sell on price. We do not limit you in that way. What is included in the "design refresh"? With modern, mobile-friendly websites, the design of the website is decoupled from the content and applications. In other words, the mobile-friendly design of your website is like a "skin" that is overlayed over our applications and your website's content. Even if we build a one-off custom design for a website, this design skin is still saved as a "theme" for your website. Over time, we have collected many turn-key theme layouts from the custom projects that we build. These layouts are all re-usable, and can be applied to your website as a new skin. One of our main competitors, hides the fact that they only have 1/2 dozen themes that actually work on mobile devices. Beware of companies that ask you to choose from a "Warming Guide", which is just a color scheme added to one of their 1/2 dozen themes. We now offer over 20 themes, and we are adding new themes each month. A theme can be modified with branding, colors, photography, typefaces, and interchangeable applications areas (like news and event boxes). Themes and layouts are here: https://www.evogov.com/themes. If you choose to refresh the layout of your website, using one of our themes, we will do that at no charge once you have hosted with us for 2 years. Custom refreshes are also available at an additional cost. Do you migrate our website content as part of your design fee? Yes. We will migrate all of the content in your website that is current and valid and approved by you. Typically, when websites come to us for a redesign, they are lacking in the area of usability (content is difficult to locate). So before content is migrated, we spend time to create a flowchart of how the site is structured. We will create both a "before" and and "after" flow chart for your website, which outlines improved usability and structure. 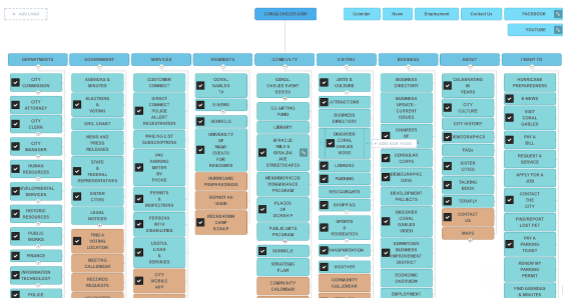 These flowcharts are useful for tracking website content migration as well. The checkmarks that you see above indicate that each area was migrated and checked for quality. Our main office is located in Parker, Colorado, and we are always on the lookout for talented web professionals to join our team. Most of our meetings are web-based, but occassionaly we do meet with clients at our office. We also have team members in other states. All of our employees are full-time and USA citizens. Contact us for more information if you would like to meet us locally. In 1997, we began as a corporation named "Delaware.Net, Inc" which serviced local customers in the Delaware area. That company built the first generation CMS that evolved into the Evo Cloud platform of today, as well as many other web applications. In the early 2000s we built our very first municipal websites under the Delaware.Net brand. In 2010, the "Evo Government Websites" brand was developed as a DBA for the Delaware.Net, Inc. corporation. In 2015, we created a brand new Colorado USA corporation named "Evo Studios, Inc." so that we may consolidate operations in Colorado. EvoGov is our government portfolio. We feel that being a small business is an asset, because we can offer personalized service without passing on high costs as we grow (and we are growing). It also makes us incredibly nimble. We see larger companies charging very high fees and it is probably due to their head count. When we operated our own datacenter in Delaware, we had close to 20 employees. Operating our own datacenter was incredibly expensive, especially when you consider that most web design companies do not own a datacenter. The costs of operating that datacenter, combined with the staff requirement, took resources away from our web development and programming initiatives. Today, cloud technologies have honestly changed all that. Please see our job link for more information on current positions. The company is a C Corporation in the State of Colorado with one shareholder owning 100% of the stock. The President of the company is John McKown. How did you come up with the name "EvoGov"? When we set out to redesign our software platform in 2012, we asked ourselves "What would the best possible website system look like?". We designed our new system from the ground-up to use the latest technologies and leapfrog our competition. It was to be the next step in the evolution of government website development and hosting for us. And that is where the Evo name came from - evolving government websites beyond the old days of local servers and outdated software platforms. It embodies what we set out to do with our latest creation. 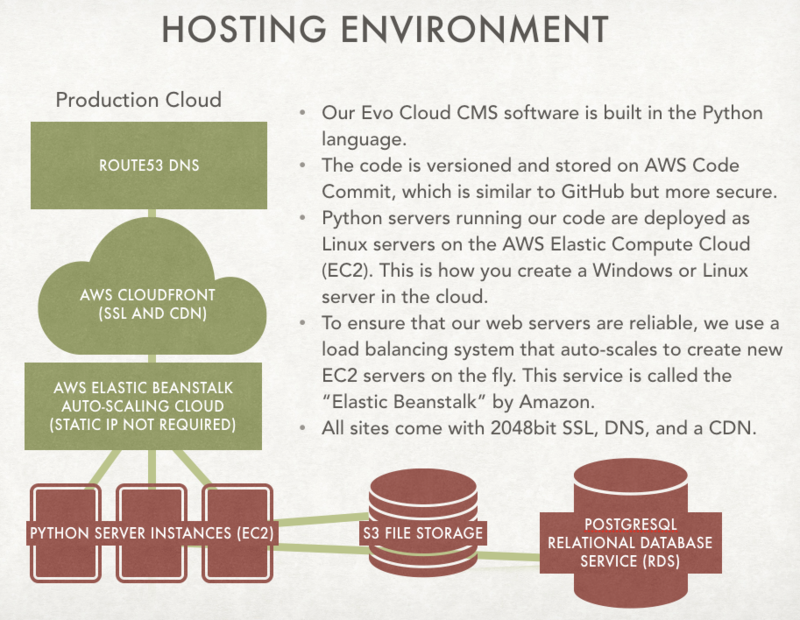 It took us two years to design it, build it, test it, and try out various hosting strategies. You can read more about our new platform in our technology section of our website. Evo Cloud is a new way of building websites that goes beyond software alone to build systems that are open, scalable, transparent, reliable, and safe. What is your business continuity plan in case of a disaster? We have seen what happens when a web design company goes out of business, and it isn't pretty. We have had customers come to us after losing their provider for a number of reasons. After 18 years of building websites, we have seen this happen numerous times. Business continuity agreement provisions - our agreements are written to protect our customers. In the event of a busines catastrophe, we offer all necessary code, files, and documentation to run your website on another server. Insurance - we purchase business insurance to protect our company and our cusotmers. Backups - we backup our data daily. Are you looking for partnerships, investors, or to be acquired? We are insterested in growth and dominating the municipal website market. If we can achieve that goal faster and better with an equity partner that makes sense, then we are interested. We are here for the long haul because with over 30,000 municipalities in the USA alone (and many in Canada as well), there is a tremendous market opportunity for us. We offer 24x7x365 support for anything related to uptime of our hosting operation. We will provide you with emergency contact information in case there is an issue with your website. However, we have systems in place already that email and call our team if a website is not available. Phone support hours are 8:30EST - 7PEST. We have staff in east coast and mountain time zones that answer the phone. Why is telephone support not 24x7? Because we used to offer this, and it was simply not utilized by our customers. Many organizations believe that they will want hand-on technical support at off hours, but since training is always included with our projects, it is very rare for customers to need phone-based training to use our applications. New hires that your organizations bring on will need to schedule their web-based training with us ahead of time. Training for your new hires after your website is launched is billable at our standard hourly rate. There is an online help system for the CMS that includes how-to articles and training videos. Do we offer a printed manual? Yes. Our manuals are on the www.evo.cloud website. Email support is 24x7x365 by emailing support@evo.studio.